Once upon a… Toy Shop is a Brick and Mortar business in San Francisco. They are looking to expand their presence into the world of e-commerce without losing their small shop identity. Create an e-commerce site which balances both the user and business needs. The business provided me with 3 personas to consider in the design process. 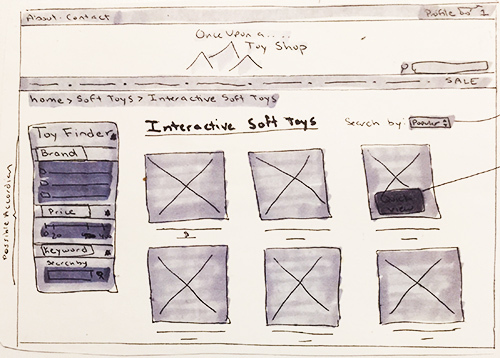 I dissected the key take-aways for a seamless user experience. I interviewed key stakeholders to understand the necessary features for the business. I reviewed the strengths and weaknesses of the sites to get inspiration for my design. 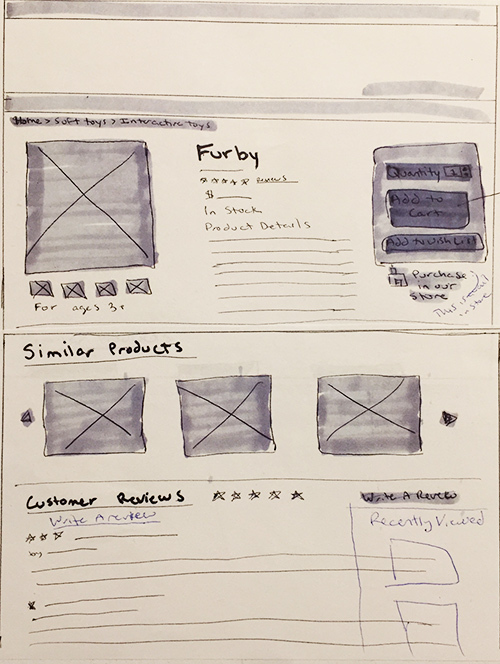 I considered the site heuristics to to apply good design principles to help inform and guide my design decisions. I conducted an open card sort to determine how to categorize inventory in the most accessible way. I conducted a closed card sort with the online program OptimalSort to ask potential users how they would distribute toys amongst the categories. I used this information to help inform the decision for the most seamless experience. Documenting the step-by-step process provided the guidance to deliver a direct and fluid experience. They defined the how and why of our different users. Scenario: Father visits the website to purchase a Lego Millenium Falcon for his daughter. Scenario: Grandmother returns to the website looking for a beginner level magic trick for her grandson. Scenario: Retro-collectior has selected an Evel Knievel Stunt Cycle, and now wants to complete the checkout process. I conducted usability testing with 4 people. 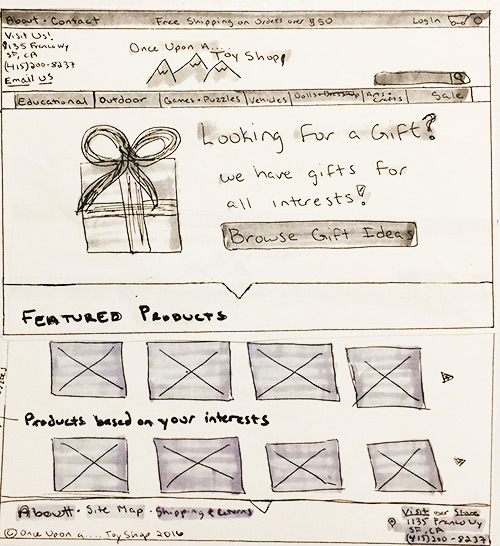 The feedback was incorporated into the wireframes. Responsive Site: Creating a responsive site is a necessary step to making the site accessible to users from all devices. Content Strategy: I need to discuss the content strategy with the business to make sure the site matches their available resources. Newsletter: I would recommend the store consider having a newsletter for loyalty customers to provide them with coupons and announce new products based on their interests.